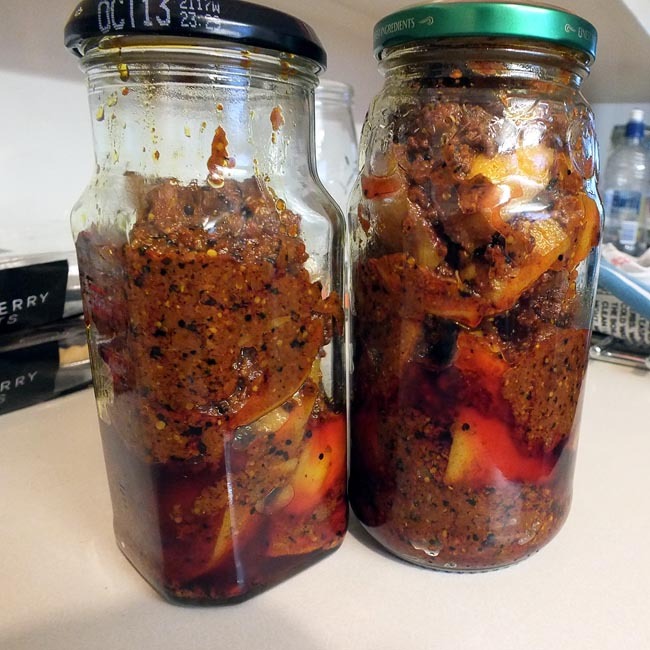 The hot lemon pickle recipe is, well, hot. Great if that’s what you’re looking for, but sometimes you want something sweeter, less oily and less incendiary. This pickle is easier to make, too. This makes somewhere over 1kg of pickle (I didn’t think to weigh it). This recipe is almost entirely jar-based. You need space to throw the salt and sugar around, so it’s back to our old friend the large kilner jar – sterilised, of course. Wash and dry the fruit. As usual, make sure you’ve removed any wax. Squeeze a few fruits until you’ve collected about 125ml (1/2 cup) of juice. Keep the skins! Cut the skins, and the remaining whole fruit, into pieces that are the right sort of size that you want to find in your pickle. This might be eighths or quarters, depending on your taste and the size of the fruit. Put all the chopped pieces into the jar. 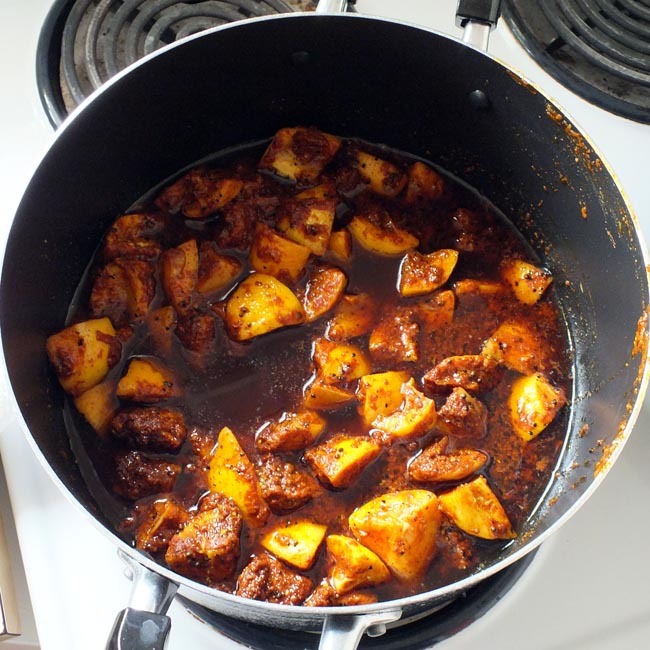 Mix the juice, salt and turmeric, pour it over the fruit. 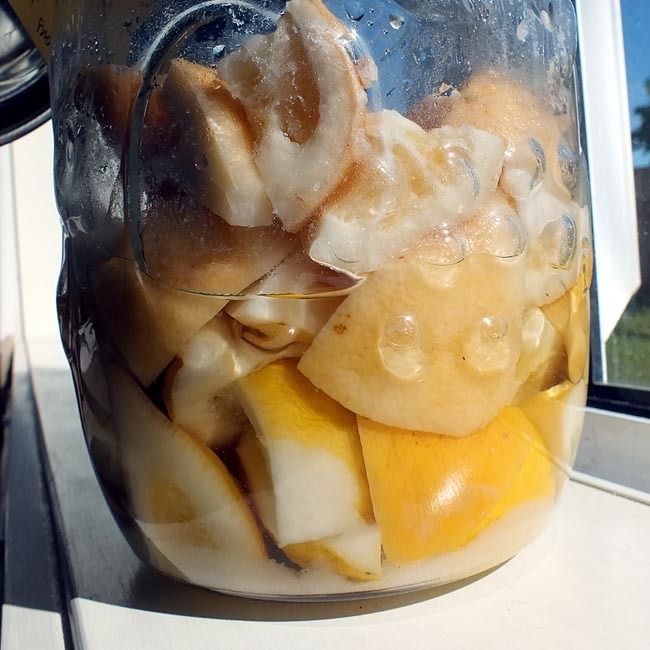 Compress the fruit in the jar so that it’s all covered by liquid. Put the lid on and leave the jar in a warm sunny place. While it’s ‘cooking’, give the mixture a good shake-up every couple of days. You’re waiting until the fruit has softened; expect this to take about a week and a half, longer if it’s cold. Throw in the sugar and mix well. Put the jar in a safe place (doesn’t have to be sunny this time) for another week and a half or so. The sugar sinks, so give it a good stir every couple of days. When most or all of the sugar has dissolved, it’s ready. 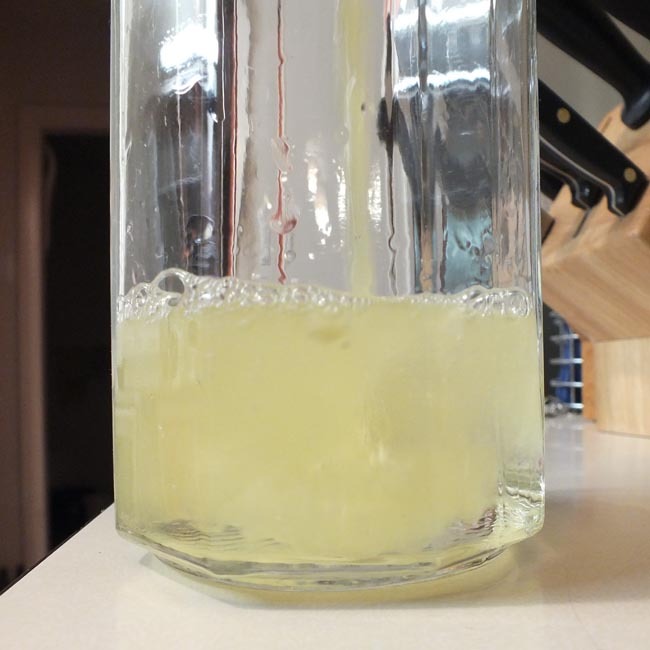 I found three distinct layers – floating lemon pieces, the denser sugary syrup, and the undissolved sugar. Finally, add the chilli powder and stir well. It’s now ready to bottle and/or eat immediately. If you bottle it later, be sure to stir well as the fruit tends to rise in the sugary mixture. No need to refrigerate. Apparently it keeps for over a year if you leave it in a cool dry place – but it’s so yummy, I’m not sure it’ll be around that long! I’ll be making more of this, it’s awesome with poppadoms or as a side with a curry. You could probably try this recipe to good effect with other citrus fruit, but the combination of the sour lemons and sugar really works well on the taste buds. If you’ve enjoyed this recipe, have a look at Ross’s other lemon glut-busting recipes for lemonade, lemon liqueur, and lemon sorbet (which you might be needing, if you decide to experiment the hot pickle!). Today’s Guest Blogger is Ross, from Christchurch, NZ. This one is a bit friskier, with the smoking hot oil making the kitchen smell strongly of mustard for a while – you have been warned! This made about 1kg of pickle for me (including some excess oil). 300ml mustard oil; 1/2 tsp asafoetida (hing); 12g mustard seeds (crushed). Start by sterilising a large glass jar – a kilner-type jar like the one pictured is ideal. Wash the lemons, dry, cut into eighths; you don’t have to remove the pips, but I did. Put the lemons in the jar. Add the salt and shake it all up well to spread it all over them. Cover; leave in a warm place for 1-2 weeks. (I put it on the windowsill which catches the sun nicely.) The juice leeches out of the lemons; where they’re exposed to the air, the lemon pieces soften and go a dull brown colour. Mix the fenugreek, mustard powder, chilli powder and turmeric. Add this to the jar and shake it around gently. Re-cover and put it back into the warm for 2-3 days. Transfer the lemon pieces and spices to a large saucepan. Heat the mustard oil in a large frying pan. Fry the mustard seeds and asafoetida. Mix well. Allow to cool, transfer to a bowl, cover once more and leave in the warm for another week or so. 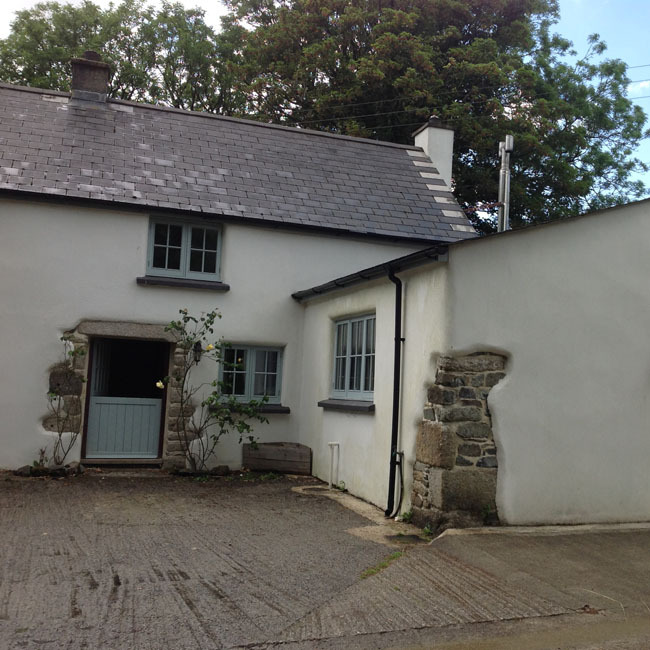 Warm thanks go out to Ross for these four great blog posts – hopefully he’ll be back with some more antipodean country skills for the blog in the future! 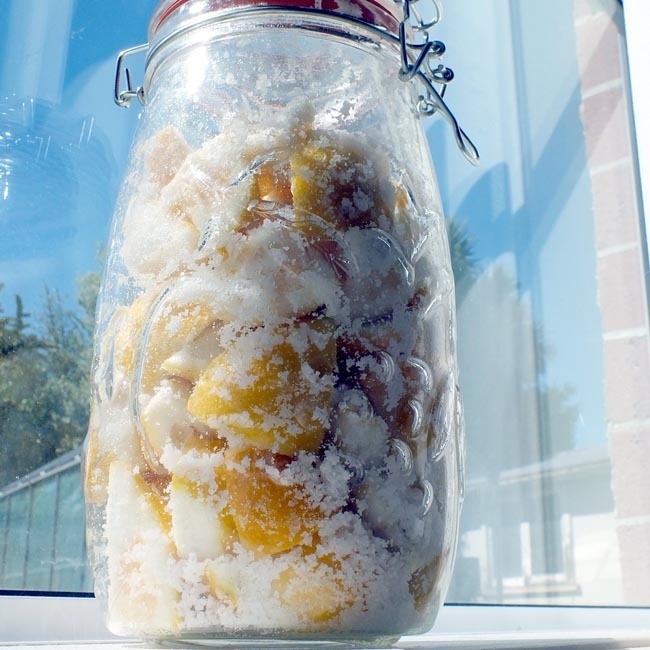 Have a look at Ross’s other lemon glut-busting recipes for lemonade and lemon liqueur, and lemon sorbet (which you’ll be needing, after sampling this pickle, I think!). I hope you’ve all enjoyed this contribution from a great guest blogger as much as I have! Next up, to cleanse the palate, a simple sorbet. Note that if you have an ice cream maker it’ll make life easier, but it’s not mandatory (I don’t have one). This recipe uses 8 lemons, and makes about 2.5 cups of sorbet. Make up some simple syrup (see post 1 of this series) with 1 cup of water and 1 cup of sugar. While it’s cooling, zest most of the lemons. 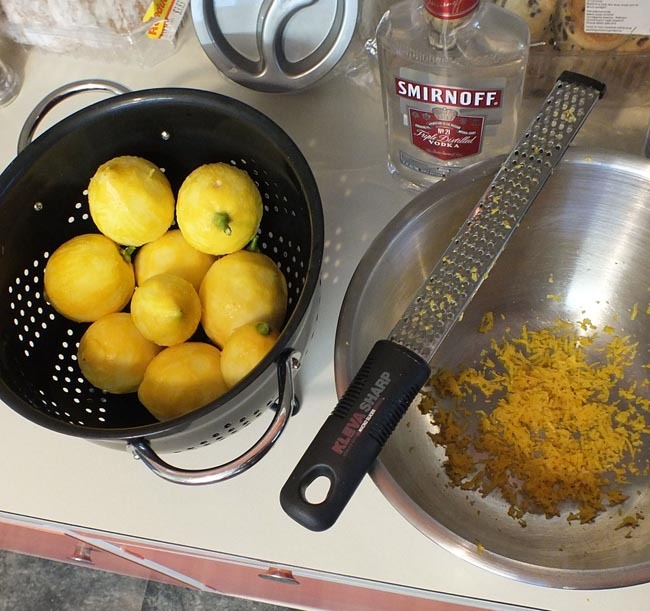 You’re looking for about 2 tsp of zest – the finer, the better – I reckoned I had enough after six lemons. Juice the lemons. You’re looking for about a cup of juice. 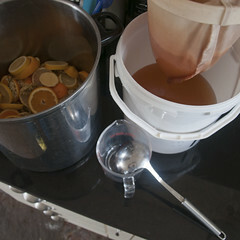 Mix the juice, zest and cooled syrup. Chill well (I left mine in the fridge for a couple of hours). Now freeze. If you have an ice cream maker, you’re all set – but I don’t. That’s OK, it just means a bit more effort. 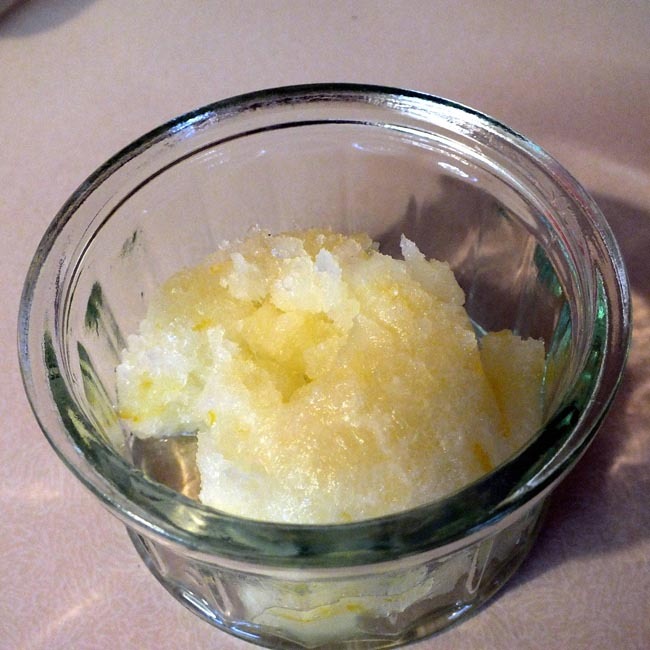 The end product is a water ice, not a block of solid ice, so all you have to do is fluff it up a bit as it freezes. I split the mixture into a couple of clean shallow plastic tubs and put them in the freezer. Then put it back in the freezer. After 12-24 hours it’s frozen enough to serve. Have a look at Ross’s other lemon glut-busting recipes for lemonade and lemon liqueur. Coming up soon, lemon pickle. Watch this space! I did the first part of this at the same time as I made up some lemonade. This was a small test batch but will scale up directly. A half bottle of vodka (375ml) – not flavoured, you want something as pure and tasteless as you can find. 8 lemons (zest only). Go for lemons with thick peels if you can, to maximise the amount of zest. Sterilise a large sealable jar. This is the same as for making jam – a careful clean, rinse well, then dry in a slow oven. Scrub and dry the lemons, make sure you’ve removed any wax. Now zest them; be very careful not to take any pith or you will spoil the result. While the jar was cooling, I juiced the lemons to make the lemonade. Put the zest into the jar and add the vodka. Make sure all the zest is covered, then seal it up and stash in a cool dark place for a while. I found a number of different recipes suggesting anything from 2 to 45 days; I left it for two weeks. Make sure your bottles are clean and dry. You’ll end up with slightly more by volume than just the vodka. Prepare a simple sugar syrup, and let it cool. The amount of syrup you need is whatever will dilute your starting liquid to the desired strength (traditional limoncello is 30-32% ABV). In my case (375ml of 37.5% ABV vodka) this calls for 80ml of syrup. 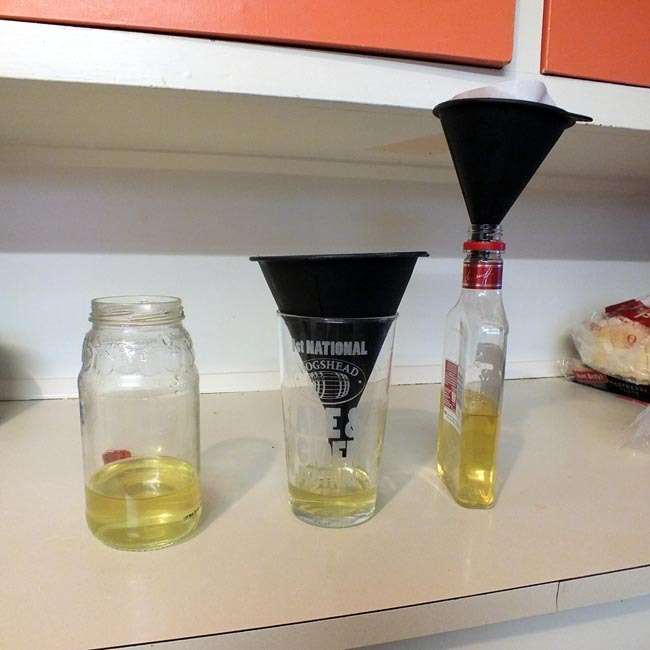 Combine the infused alcohol with the syrup. Stir well. Optionally, say some recipes, let it rest for a few more weeks (I didn’t). Now filter carefully; for best results filter more than once. I started out with a sieve, then switched to coffee filters. I filtered it four times, which might be excessive; I set up a little production line (pictured). The filtering was slow, and the setup easy to knock over; I found myself longing for some clamp-stands like I used in chemistry class in high school. Unsurprisingly, the filters clogged quite readily; I got through several of them. Bottle directly from the last filtration; the liqueur should be clear but coloured. At this point the product is very sweet and sharp. Let it mature in the bottle for at least a week; both the sharpness and the cloying sweetness melt away. Serve cold (direct from the fridge, or even the freezer). It’s dynamite-strong; take care! Coming soon, more lemon glut-busting recipes from Ross – lemon sorbet, and lemon pickle. Watch this space! We have a lemon tree. 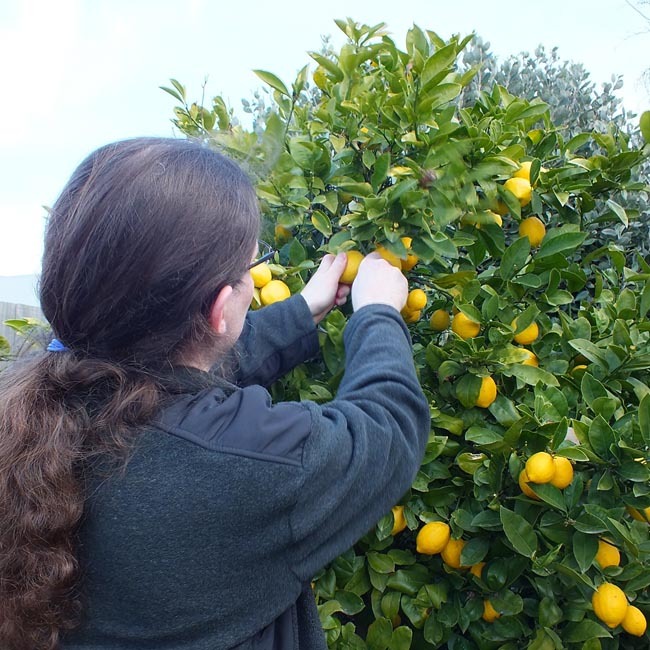 Consequently, we have a lot of lemons. It’s just turning to spring here in New Zealand as I am starting to write this, it’s our first spring in this house, and we have a crop ready to harvest. As a long time reader of the Country Skills Blog I went fishing for suggestions. 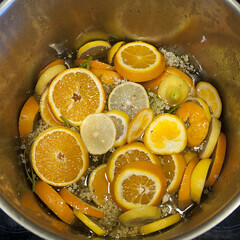 There is plenty of marmalade on here, which I must get round to trying out sometime, and everybody has heard of traditional old-style lemonade, but what other interesting things can we do with them…? Studying some recipes I found recipes for a lemon liqueur not entirely unlike limoncello, which use only the zest of the lemon, whereas lemonade uses only the juice. A perfect combination for the first experiments! This comes up in a few of these recipes, so I’ll describe it once. Take roughly equal volumes of sugar and water. Mix and heat in a small pan; boil gently until the sugar has dissolved leaving you with a clear syrup. You usually want to leave it to cool before you do anything else with it; if not, take care – it’s like napalm. (optional) fresh mint to garnish. 120ml of lemon juice + 1/2 cup sugar makes about 650ml lemonade. Juice however many lemons. 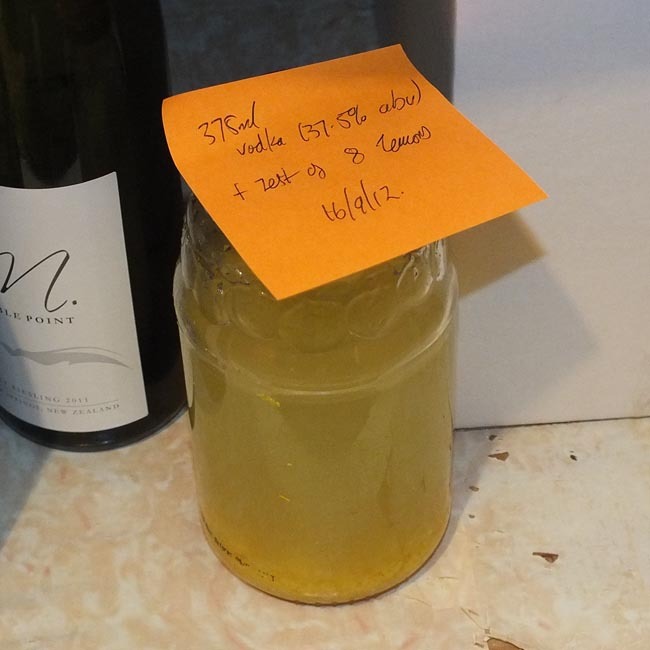 I got about 120ml from the eight lemons I used for my test batch of limoncello; I could have probably got some more from them if I had tried harder. Make up some simple syrup following directions above. 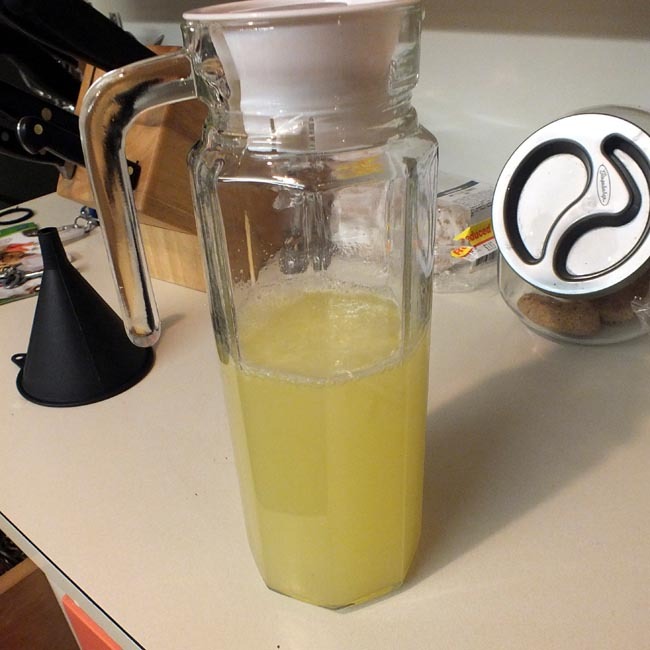 I used the same volumes of water and of sugar as I had lemon juice – near enough 1/2 measuring cup of each. Let the syrup cool, then transfer to a jug. Add the lemon juice, then more water to dilute: three times as much water as you put into the syrup, so I used 1 1/2 cups. Chill well before serving. If you have any fresh mint to hand (I didn’t), it would make an excellent garnish. 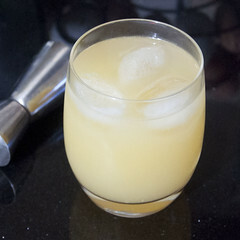 Coming up soon, more lemon glut-busting recipes from Ross – lemon liqueur, sorbet, and lemon pickle. Watch this space!